Previous torque stand designs from other manufacturers used either a steel key meant to engage the slots in the bottom of the cell housing, or a collet to grip the housing outer surface to prevent the housing from rotating during assembly. Both of these designs have major weaknesses. The key style stand did not have a mechanism to hold the housing in place which could allow the housing to slip out during assembly causing damage to the housing, and in some cases the user. The collet style stand has problems gripping the cell consistently and many users have reported it is difficult to hold the cell housing without it rotating during assembly. If the cell rotates during assembly the cell housing can be scratched by the collet and the maximum pressure may be inaccurate. Spin Analytical’s new torque stand combines the strengths of both older style stands resulting in a superior tool. Our new design has a flat bottom brass 5C collet which grips the cell and prevents it from slipping out of the holder during assembly. Additionally, the collet has a key manufactured from O1 tool steel embedded in the bottom of the collet which engages the slots in the bottom of the housing. The key prevents the housing from rotating at the highest torque settings, but because some of the force is taken up by the collet the operation is gentler on the housing slots than earlier key based torque stands. Lightly grease threads on cell housing and screw ring with an approved grease. Place cell housing onto torque stand with black collet fixture handle in the vertical position (figure 2). Gently push torque stand shaft down to cell housing and rotate until the steel key engages the slots in the cell’s screw ring (figure 3). Be sure to firmly press down on shaft to be sure it is seated correctly. Close collet by rotating handle to horizontal position and then pressing firmly down (figure 4). Install 3/8” square drive into square hole on top of shaft (figure 5). Place your right hand onto the torque wrench on the shaft side and apply pressure down to keep steel key firmly engaged with screw ring. Use left hand to rotate torque wrench in the clockwise direction to tighten the screw ring. When approaching the target pressure the torque wrench needle should not jump or jitter but move in a smooth continuous fashion. Any jumping of the needle indicates that the cell components aren’t settling into position. If this happens, rotate the torque wrench in the counter clockwise direction to loosen the screw ring and begin again. 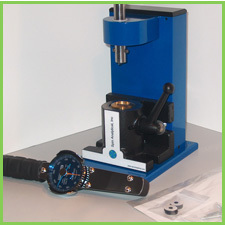 After the desired torque reading is achieved, disengage the shaft by pulling it up away from the cell housing. Remove the torque wrench and stow it in the holder at the back of the torque stand. Rotate the black collet handle to the vertical position and remove the cell.